The Big Dig was a decade+ long construction project (1990-2004) that replaced the Central Artery. The Central Artery was an old decayed steel elevated highway structure that cut through downtown Boston. The highway remained in active use while the main tunnel was simultaneously built underneath it. At a cost of about $14 Billion dollars, it is the most expensive public highway project in U.S. history. Compared to the massive Federal budget deficits of 2002-forward, the $14 billion price tag was a pittance, and paid for itself in only a few years. Commuter times were cut in half, with most downtown traffic congestion alleviated, and tourist dollars pouring into the city. The now demolished Central Artery was constructed in the 1950s. About one thousand buildings were torn down for the new road, cutting a path through downtown Boston and extending Interstate 93 south of the city. The huge ugly steel elevated structure was at times referred to as the Green Monster, named after the left-field wall at Fenway Park. The highway was designed to carry about 75,000 vehicles per day, and by the 1990s it was carrying more than twice that at 190,000 per day. Boston was a vibrant seaport from 1650-1920, and the Central Artery completely dissected Boston from its historic waterfront. Debate began in the early 1980s on how to replace the aging structure in a cost-effective manner. There was a proposal to completely bypass the downtown with suspension bridges. In 1986, a lot of graffiti had been strewn about the artery and Tobin Bridge advocating this bridge solution. The proposal was called the Boston Bypass Plan, and the graffiti used to say "Back the B.B." under the silhouette of a suspension bridge. Funding for a new tunnel system was eventually negotiated in Congress by former House leader Tip O'Neil. Environmental impact studies were done in the late 1980s, and modest construction had started by 1993. Some of the strange events surrounding the Big Dig include the initial suspension bridge debate, the controversial Scheme Z plan to build a stacked interchange over the Charles River (eventually set aside for the Lenny Zakim and Leverett Circle Bridges), the original Liberty Tunnel name which was considered quite ordinary for such a large project and then later re-named the Thomas P. "Tip" O'Neill Tunnel, and the current issue of water leaking into the tunnels. 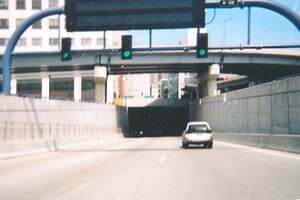 Tragically, on July 10th 2006, a three-ton concrete section of drop-ceiling in the South Cove tunnel collapsed, and killed a 38 year-old woman. Inspection and re-enforcement of all the ceiling hangers in the tunnel was completed after this incident. To save billions off the $14 billion price tag, this layperson would have recommended closing the Central Artery completely during construction. The savings could have easily built brand new rail lines into Boston from 3-4 huge suburban terminals (with ample garage facilities). This option would also have saved $2 Billion for the short tunnel under the rail line in South Cove. And importantly, closing the Central Artery would have allowed less expensive cut and cover tunneling in most sections, with a secondary wall system for drainage, to ensure the new tunnel would not be damaged by water penetration (most of the tunnel is built in areas that were land-filled in the 1800's).